It's your year of firsts: First freedom. First job hunt. Now it's time to make your first resume. It's an uphill battle when you have a resume without work experience, like when you need a college freshman resume or some other type of undergraduate college resume. The road ahead is dark and full of terrors. How do we make your resume the interview winner? Keep your chin up, and keep scrolling down. We'll walk through this together, step by step. You'll soon have a great resume with no experience that will soon get you your first paycheck. Entry-level resume examples better than 9 out of 10 other first job resumes. How to write a resume with no job experience that will still land you interviews. Tips and examples of what to put on a resume with no experience. The best way to describe your skills and achievements on a resume without experience. How to create the best possible cover letter with no experience. 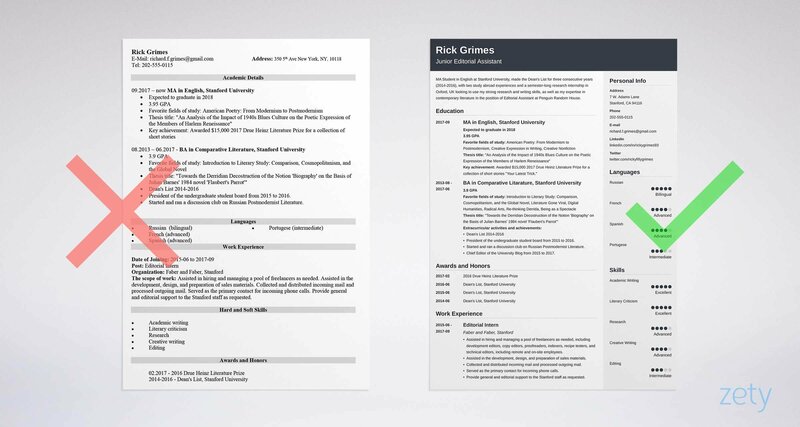 Here's a sample beginner's resume for an entry-level job made using our resume builder. Sample Resume With No Work Experience - See 20+ resume templates and create your resume here. Dozens of people are applying for the job you want. Their resumes are all jam-packed with experience from past jobs. And that's great, for them: 65% of employers want candidates with prior experience. Everyone's got a solid experience section: with bullet points, dates, and different places. They've listed their experience in the reverse-chronological format, a favorite in resume writing. As for you? You've got a blank, white space where the experience section should be. We don't want a blank, white space. Stick to a chronological resume format. Highlight your achievements and accomplishments. Underline your education and relevant skills. Include internships, extracurricular activities and volunteer work. Use relevants resume keywords and customize your resume. Pro Tip: Remember that putting the most important information towards the top of your resume is always good practice. Some might tell you to use the functional resume format for a resume with no work experience, but we advise against that. It leaves off key details and is open to interpretation. Want more help getting started on your first resume? Check out our guides on How to Begin a Resume, Resume Mistakes to Avoid, Choosing a Perfect Resume Font, and Outlining a Resume. You've got no experience, but your education section is impressive. On a resume for a first job with no experience, your education section gets upgraded to the top, just below your compelling resume objective (more on that in the following section). So, how should we put your education on your resume? But what if you are still a college student working on your university degree? High school graduate or student? It's absolutely fine! Just feature your most recent diploma or education. If you've completed a higher-ed degree, skip listing your high school on your resume without job experience. Pro Tip: Avoid adding your GPA if it is too low (like under 3.5). This would turn them off and would have hurt instead of helped! Need more examples and advice of how to put your education on a resume with no work experience? Educate yourself with this article: How to Put Your Education on a Resume [Tips & Examples] and, while your at it, see our guide on How to Pick a Major. We're moving things around on this resume, to prioritize your best assets. But there's one thing we always want to keep on top: the heading statement. The heading statement is a sure-fire way to catch the recruiter's attention, just like a perfect movie trailer. In your case, it's a resume objective, since this is a resume without experience, but we'll help you write one that will read like a summary for a resume with no experience. Here, you'll highlight transferable skills from other areas. This will make the case that you might not have experience with this position, but you do have experience which is relevant to it. See that? Katrina here wants to get a job as a painter with Paint Saints, so her painter resume objective emphasizes her related coursework and unpaid experience at home. Pro Tip: Keep it short and sweet: 3 to 4 sentences is best. Want to say even more? Then make the perfect resume without experience, land the job, and then you can talk to them all you want! How do you write a resume for a job with no experience? Wait . . . whaaaaat? I know, sounds like a catch-22, but just hear me out. Learning how to do a resume when you have no work experience is much easier if you can show some seasonal or temporary work experience. If you have any part-time work, that will go a long way towards a great experience section. Have dreams of investigative journalism for the New York Times? Do some freelance writing work from places such as Upwork so that you can have a few published samples in your resume without experience. Still want to say you don't have experience? Also, remember how you might not have hands-on experience, but you do have relevant skills? Well, you live in a wonderful age: you have resources like the interwebz and the vast knowledge it offers at your fingertips. Not only are they immediately accessible, but many of them are absolutely free - a price that fits any budget. Try taking some online courses from EdX, Udemy, or Coursera, particularly ones relevant to the job you are looking to obtain. Pro Tip: Now that you have some experience, add some of these people (teachers, freelance employers, etc.) on LinkedIn. Now you are networking and building contacts in the industry! You're a prizewinning gymnast. You make the best vodka-based beverages. You can deadlift 517 lbs. You're talented, for sure. However, it would be weird to list these skills when writing a help desk resume, for example. The point is: you must tailor your skills to the job listing. Browse the job listing and underline important resume keywords throughout. Add these to your resume without work experience - but no lying! To round it off, add some hard skills and soft skills which are unmentioned in the job listing. Hard skills are specific abilities and know-how (e.g., intercom system). Soft skills are self-developed, life-learned attributes (e.g., adaptability). Oh, and want more of these nifty definitions? Check out our HR glossary of career terms! Pro Tip: Try this: Type any and all of your skills into an Excel column, with a number (1-10) of importance and flight crew relevance in the adjacent column. Then, remove from the worst up until you have the best 5 or 6 and can zipper it shut. On a resume without experience, you have one advantage over other applicants: you get to have more space to spend on the other sections of your resume. Volunteer Work: Have volunteer experience? This is working experience! Now you don't have a resume with no work experience, but a resume with some experience. Certifications: Passed a workplace certification at school or through a career fair? That could definitely be useful in your first job. Hobbies & Interests: Optional, but it could help to showcase the human side of you. If you studied the manager and saw she likes baseball, too, it could be a way to catch their attention! Languages: Know another language? Don't forget to note this in your entry-level resume. Awards & Commendations: That something proud you were awarded back in uni or elsewhere sounds perfect to put on any resume. Pro Tip: There are resume sections that you no longer need to put on a resume with no job experience, such as the reference section. They know they can ask you for references, so skip saying "references available upon request." A resume and a cover letter. No one likes writing them, but 45% of recruiters say they will reject a resume without a cover letter. That's about one in two. So yes, a cover letter is necessary. You've taken your time on your resume without experience formatting the template, adding the sections, and putting it all together. Now it's time to craft an impressive cover letter that'll wow them. Address them by name: Do a bit of digging and find out the name of the hiring manager. This personal touch will grab their attention from the very beginning. Get worked up: Explain to them why they need you for this position. Speak of the company: Mention something about the company that you relate with. You dropped their name and caught their attention - now seal the deal with this next personalization. Use your imagination: Be witty. Be charming. Be clever. Positively grab their attention - it will mean more than degrees and certifications you list in your chef resume. Pro Tip: The only time you shouldn't include a cover letter is if a hiring manager has explicitly told you not to send one with your resume with no job experience! Need a template for your cover letter without experience? Want more tips? See our guide on how to write a cover letter with no experience. Since you're here writing a resume with no experience, I would be remiss not to remind you to make sure you have your online presence cleaned up. Make sure your social media accounts are employer-friendly. Remember that photo of you and your best buddy downing Jaeger shots from Spring Break 2017? (Yeah, you don't remember, and that's part of the problem!) Recruiters won't trust you with their brand image if you can't manage your own. You see, the employer will google you anyway. Your social media profiles and all those embarrassing photos will come up first. You may have fixed your LinkedIn profile to prepare for your future job, and that's great. But, you won't get it if your Facebook and Twitter are filled with photos of drunkenness and cursing. To be completely safe, it is best to delete those images, as you'll have way less chance of the recruiter finding something. Pro Tip: To check what your Facebook profile looks like to others, click the menu icon, then the link marked “View as.” This lets you view your own profile the way others would see it. A resume with no work experience sounds like a losing battle, at first, but with this strategy, you’ll have a resume they won’t be able to resist. Focus on education - You’ve no experience, but you do have education. You’ll highlight your academic achievements to stay in the running. You do have experience - And if you don’t, get some! Use free or inexpensive courses online, such as Coursera, to add relevant experience. Now you have a resume with a little experience. Also, things you don’t think of as work experience may actually be, such as volunteer work, a stint with an NGO, or freelance gigs. Other sections - Without the massive experience section, you are able to add more “other” sections. Use these to promote yourself and show the human side of you. Now you should know how to write a resume with no experience that is compelling and unique, perfect for a high school resume or a beginner's resume for teens. Now, go check out our helpful interview tips and practice the STAR interview format to make sure you're ready for the big day! Do you have any questions on what to put on a resume with no work experience? Not sure how to describe your skills or achievements? Give us a shout in the comments below and we will answer your question. Thanks for reading!